One of my favorite things about the holiday season is the visits and get-togethers with friends. There's just something about that whole time between Thanksgiving and New Year that's perfect for gathering. 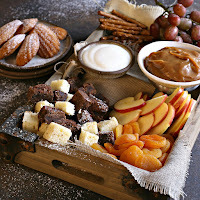 And it's the time of year when I find myself creating a lot of cheese boards and various fun appetizers but somehow I get stuck thinking dessert has to be more formal. Why? I love eating lots of little tid-bits so why should the end of the meal not be as fun as the start? So my plan for sweets this season is to make treat boards so everyone can sample different things and be able to choose what they like best. 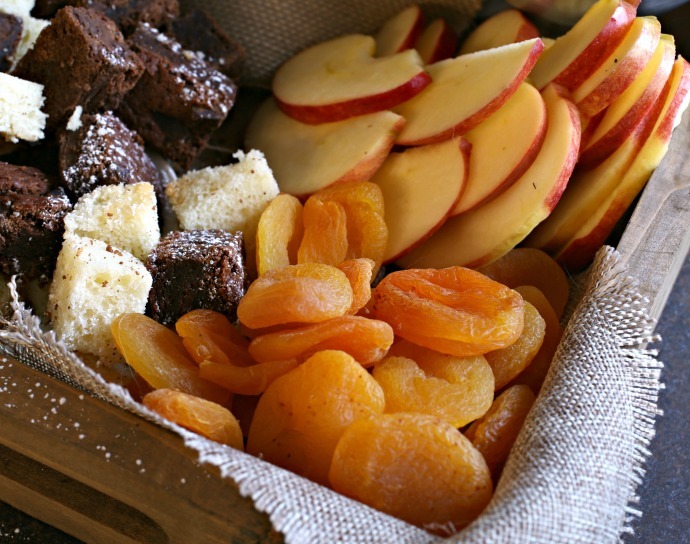 There are cookies and cake squares but also fresh and dried fruit plus some sweet and salty treats. Salty pretzels dipped into caramel is my idea of a treat for sure. You can make all the baked goods or take some help from your favorite bakery. I made a batch of fudge brownies and one of my easy banana bread loaves and cut them into bite size squares. 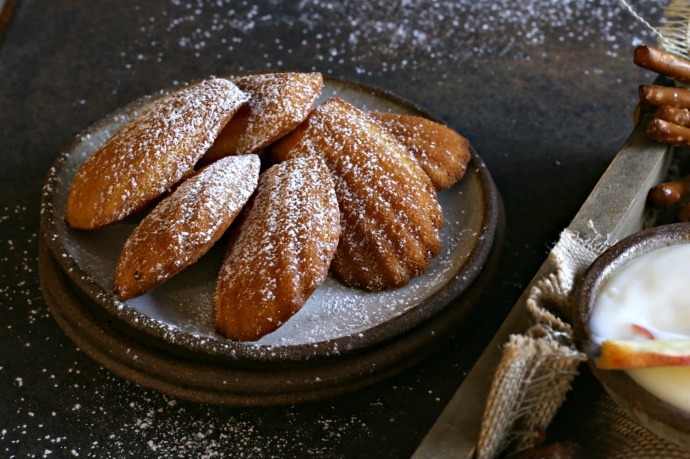 But one of my neighborhood cafes bakes the best Madeleine cookies so I picked up a few of theirs. You can use a store bought pound cake as well. 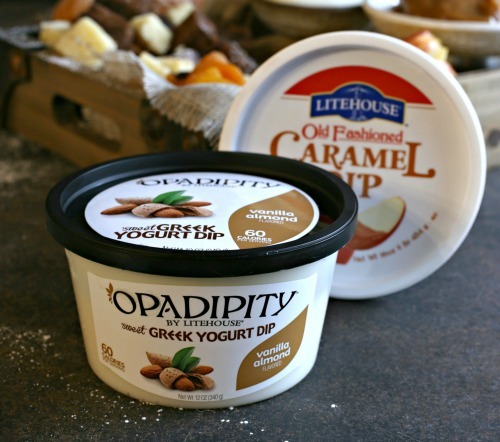 One area where I definitely got a little help from the store was two dessert dips from Litehouse Foods. 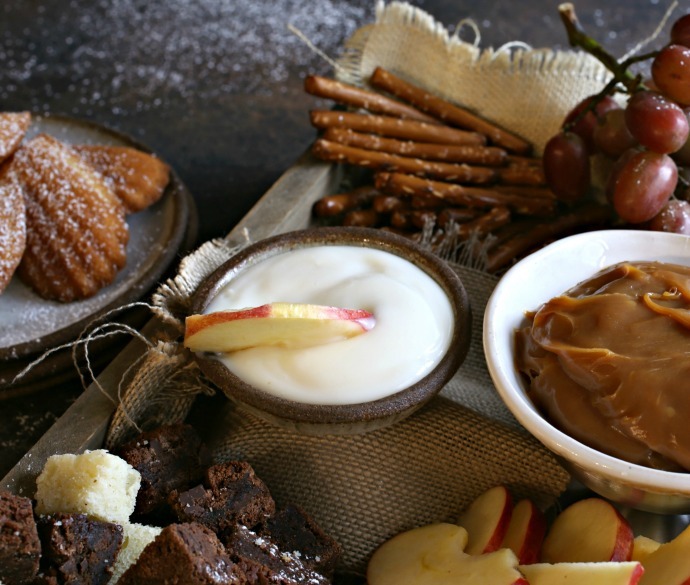 That thick and creamy old fashioned caramel dip was the perfect sweet touch to the apple slices and salty pretzel rods. And the sweet and tangy vanilla almond yogurt dip was perfect for fruit as well as for cutting some of the richness of the baked goods. Just fill a big tray with these dips plus whatever goodies you love. 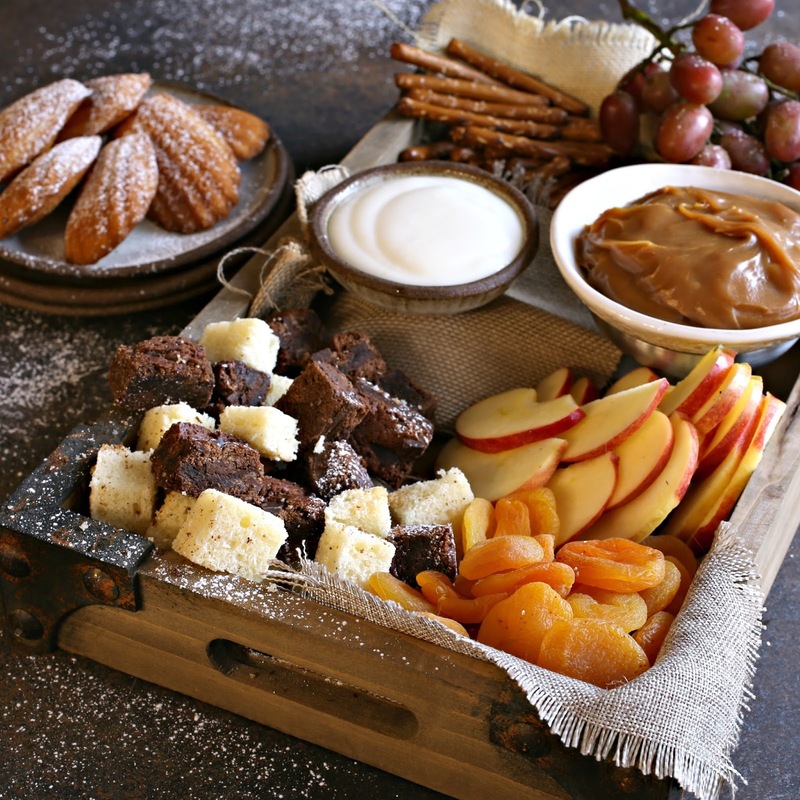 Make sure there's a selection of fresh, dried and baked and let your guests have fun creating their perfect dessert bites. Enjoy! Choose a tray or board that's large enough to hold everything and that guests can reach from all sides. Place the caramel and yogurt dips into large bowls but also give guests the option to take smaller bowls if they want to double dip. 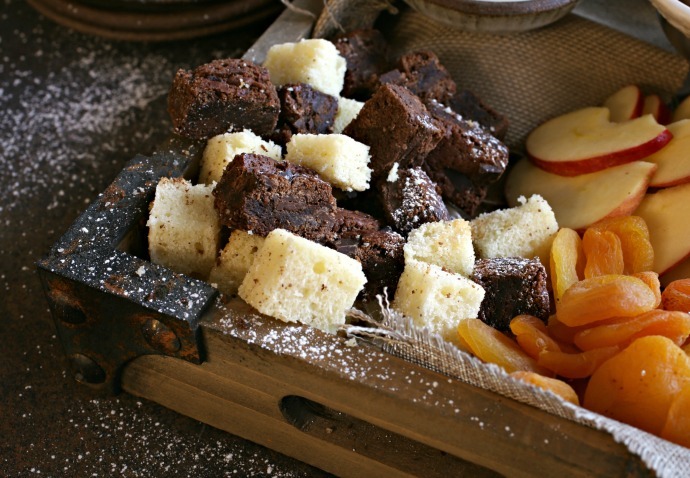 Arrange your tray with the grapes, sliced apples, pretzels, bits of brownies and pound cake, cookies and dried fruit. 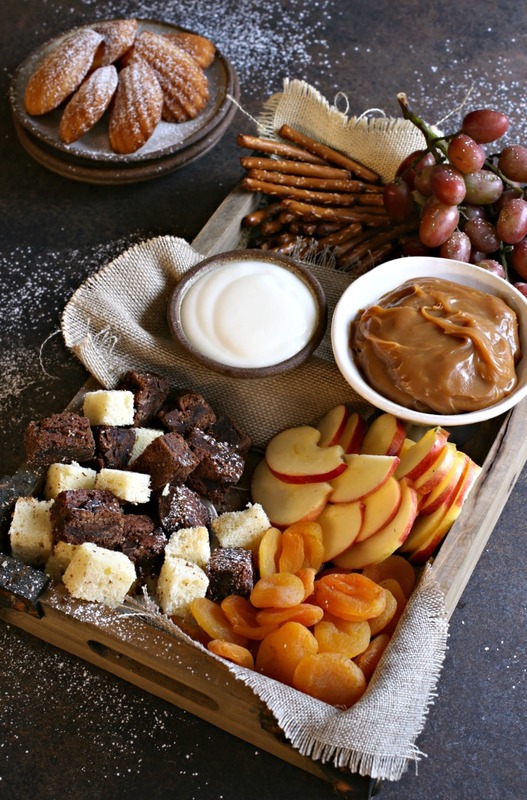 Provide small plates or bowls as well as forks or toothpicks so guests can pick up various things to dip into the caramel or yogurt. This recipe is sponsored by Litehouse Foods. Thank you for supporting the products I love and use in my kitchen.